The previous lesson asserts that if you follow one of the mathematician’s models, there is only one optimum way to set position sizes. But in practice, traders use many other methods to set sizes. The first one that gained wide attention is the 2% rule devised by the managers of the Turtle Trader experiment, which sought to prove that anyone could be taught to trade and would trade successfully if they were given enough tools — including a 2% of capital cap on any single trade. It can be easily demonstrated arithmetically that allocating 2% maximum per trade allows a number of initial and ongoing losses that will be recovered if the trading system has a win-loss ratio of better than 1:1. The problem with the 2% rule is that if you have a low starting capital stake, and many Forex traders do, you can trade only a few mini or micro lots and it will take a very long time to build a sizable capital base. Another rule set out by Alexander Elder is 6%, and the same argument applies to that one. The issue with disobeying the 2% rule is that you are giving in to impatience and greed, and likely to run your account down to zero, whereupon you have to save up to start over again. The first step in determining position size is always the amount of money you are prepared to lose, whether it is a dollar amount or a percentage of total capital. Logically, that means you have to find the stop you think will not get hit and measure from there to either the entry that is available to you at the moment or the ideal entry that would promise the greatest gain. Let’s say you are looking at the chart below. 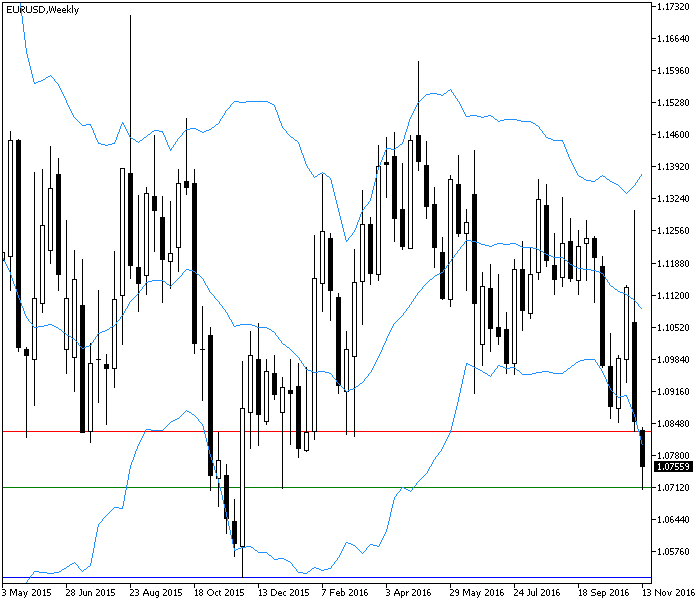 EUR/USD has broken through a minor support level. You want to go short at the current level and your stop would be placed at the support-turned-resistance (red line) at 1.0830, or 73 points from the current Ask of 1.0757. You have already decided to risk $500 on this trade, and so it can be easily calculated that you can do about 0.68 lots ($500 divided by stop-loss distance and then by the value of a pip). Notice that we are not considering the potential gain. It could be only 45 points (to the green support line at 1.0712) but it could be more, matching the previous low (blue line) at 1.0521, or 236 points. Do not even think about moving the stop down to a less-impossible level in order to get a higher number of contracts! The important point about stops is that they are insurance. You want them not to get hit, just as you have fire insurance but do not want your house to burn down. To fiddle the stop to be “allowed” to trade one or two full contracts instead of your calculated value is self-defeating. You could choose the Bollinger Band bottom for the stop, only 43 points, and be able to trade a higher number of contracts (1.16 lots). But 43 points is easily within reach of an intra-week noise movement and it is a bad stop. Granted, you would have 1 full lot, so if the B-band bottom is not exceeded and the price does fall to the previous low, your gain is delicious — but it is still the wrong thing to do. Set stops according to the likely worst-case scenario and let the position sizing follow. Let’s say this trade (0.68 lots) did result in a loss. Now what? The Turtle rule remains a good one: cut your total cash at risk by 20% when your account goes down by 10%. If your account in the euro trade above was $5,000 and your $500 max loss was 10% of capital, you now have roughly $4,500 left and your next stop should accordingly be much smaller, or 80% x $500 = $400. As you can see, volatility-adjusted size is almost twice as low as the one chosen by arbitrary 2% risk. In some cases, the opposite situation might appear — volatility size would exceed the initial 2% rule. If you are using a reasonable volatility measure and volatility is stable, you may well get away with it, but you should be aware that you could be overtrading for the amount of capital you are risking. the size of your stop. the volatility of the currency. 2. If you lose 10% of your stake, you should cut your risk by how much? 3. Normally, volatility sizing uses what factor to define volatility?